home Health Work it on out! An integral part of any healthy lifestyle is a physical fitness routine. To help you on your way to wellness in 2015, we’ve compiled 10 exercises that can be done at home, in the gym, in the studio, in a park, anywhere, really! Work on these workouts throughout the year for major benefits to your body and mind. You’ll need a TRX machine for this exercise. 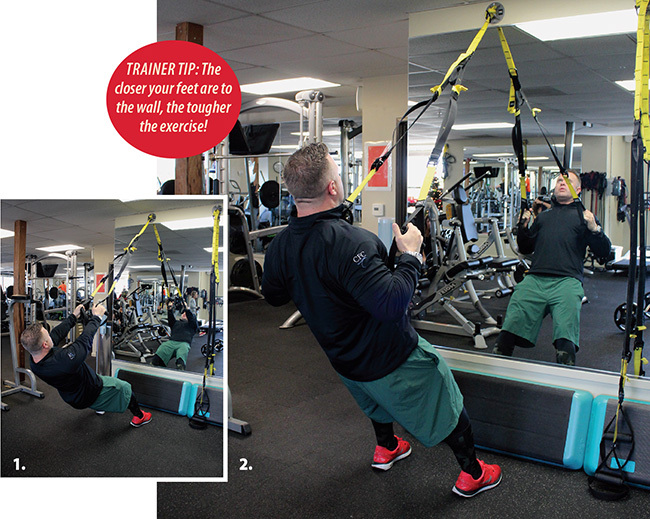 TRX machines are available at most gyms or can be affordably purchased online for use at home. Begin with your body facing the wall with a neutral grip (thumbs up) on the handles. Pull yourself up toward the wall, squeezing shoulder blades as you do so. Complete 10 to 15 reps for three sets. Begin with a kettle bell or dumbbell (or a gallon of milk or even a bag of flour) between your legs and sit back into a squat. Make sure all your weight transfers to your hips and heels and not your toes. 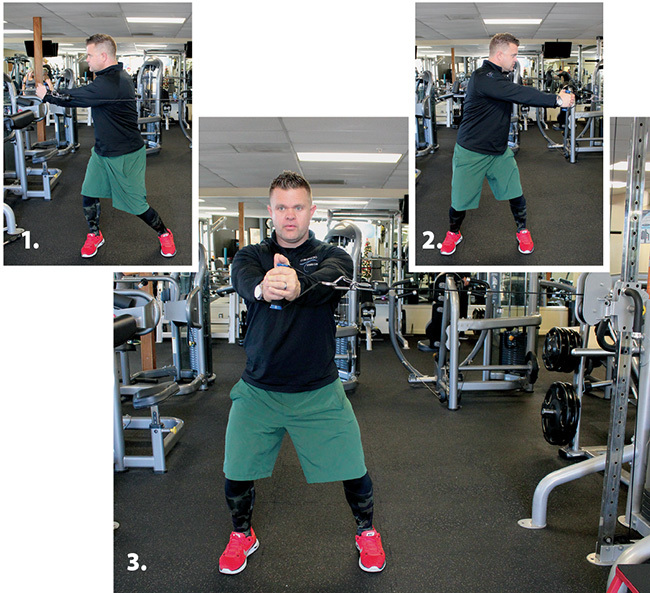 From the squat, stand up and lift the weight up to your chest, bringing arms and elbows perpendicular to your body. Repeat 12 times, for three sets. Begin in the push up position with hands out to the sides of the upside-down bosu ball with a slight bend in your elbows. 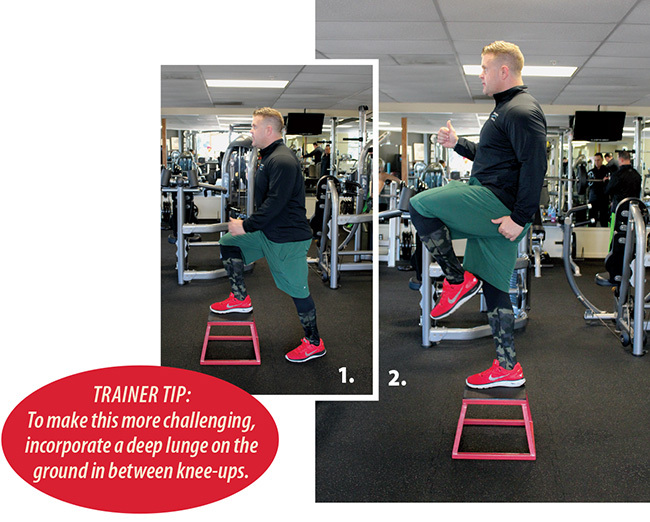 Hop legs in and out like jumping jacks. Complete at least 10 reps and work your way up to three sets of 20 repetitions. Lie flat on your back with arms overhead, holding a medicine ball or weight. Lift your hands up over your head while you lift your feet to the ceiling, bringing the weight to your toes and making a V shape with your body. Roll your shoulder blades off the ground, reaching hands up as high as you can. Lower back to the prone position and then repeat 20 to 30 reps for three sets. Remember to breathe! This can be done on a park bench, on any step, or on a metal frame box at the gym. Stand facing the box and step up onto it. When you feel stable, kick your knee up toward your chest, then step down and repeat, alternating knees. Do 30 to 40 reps (15 to 20 on each knee) for three sets. Start with a weight on the cable machine that allows you to perform 10 to 15 reps. Keeping your upper body tall with a slight bend in the knees, pull the weight with both hands across your entire body, keeping hands at chest level, core engaged and rotating at the hips. (This can also be done with a weight at home.) Repeat the same number of reps on the other side, completing three sets on each side. Linda Marques, owner of Coronado Yoga & Wellness Center and her student Jennifer Banes demonstrate four simple, beneficial poses to practice every day to improve strength, flexibility, and focus. Start on your hands and knees with hands directly under shoulders. Step both feet back so torso and legs are straight and aligned. Look straight down, keeping your neck and face relaxed. Breath slowly and deeply as you hold for 30 seconds to one minute. What it does: Strengthens arms, shoulders, chest, wrists, and abdominal muscles. Raise both arms above head, feet hip-width apart. 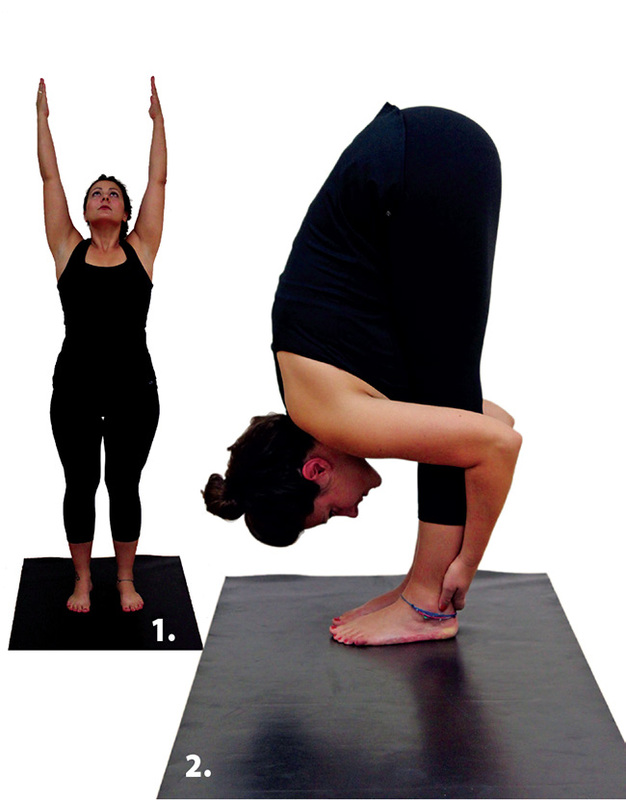 Inhale, then bend forward bringing your torso down with a flat back. Grab the front of your legs and gently relax into the stretch, lowering your head toward your shins. Aim to bring the torso as far forward as possible keeping the knees and spine straight. Take five slow, deep breaths. What it does: Provides a deep stretch for the hamstrings and up through the back and spine and stimulates blood flow to the brain. Stand with feet about three feet apart, turning your right foot out 90 degrees and left foot facing forward. With arms out to sides, moving slowly, bend to the right at the hips, raising your left arm toward the sky and sliding your right hand down your right leg, finally holding on to the lowest part you can reach. Keep your back and legs straight. Take five slow, deep breaths before repeating on the other side. What it does: Provides a lateral stretch for the spine, and opens the hips, legs, chest and shoulders. Sit in a cross-legged position with your back straight. Place left hand on right knee and right hand behind you, palm flat on the floor. Gently twist your torso as far as you can to the right and allow your head to follow. Keep your face and shoulders relaxed and take five slow, deep breaths. Switch sides and repeat. What it does: Releases tension in the spine and any stiffness in the back, increases flexibility of the spine and improves digestion.